What's New in March 2013! 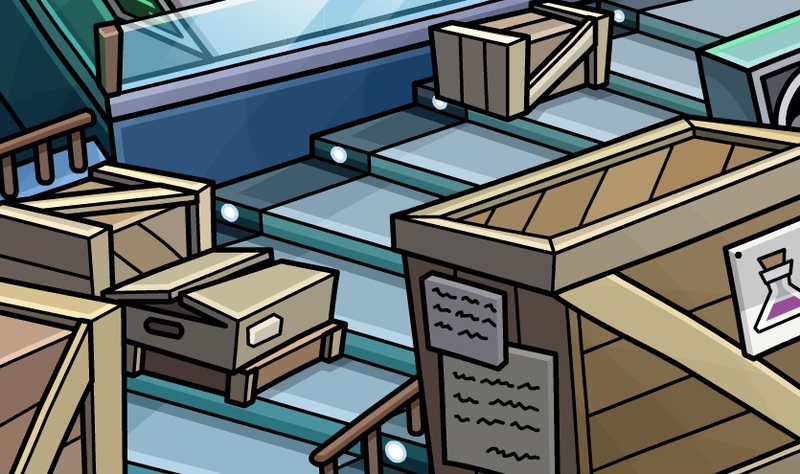 Match is almost here and theres some cool Club Penguin stuff comin up! Take a look at this sneak peek! 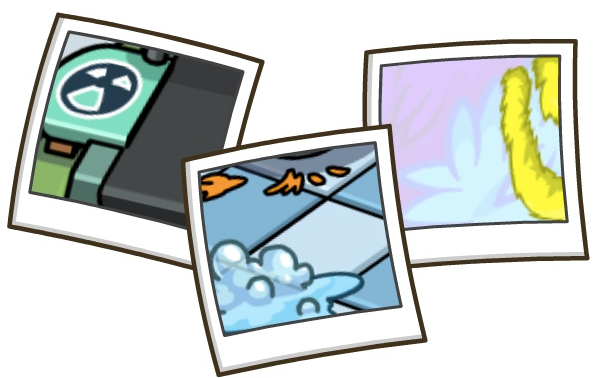 Can you guess whats coming up be these photos!? 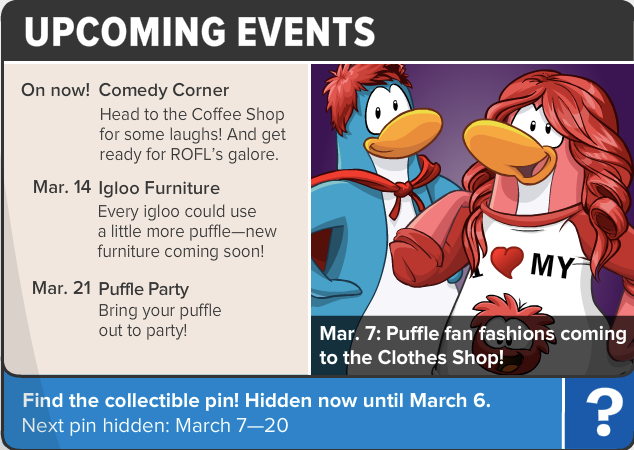 Theres a new log-off screen for the Puffle Party coming March 21st! Take a look! Man that rainbow puffle look SOOO cool! If you get a rainbow puffle, what would you name it!? 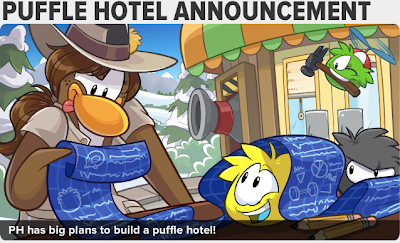 The construction for the EPF has officially started! You can pick up your hard hat in the corner there if you don't already have one! And here is the HQ! Theres like a box of some sort of screens over there. What are those? And what are in all these boxes!? 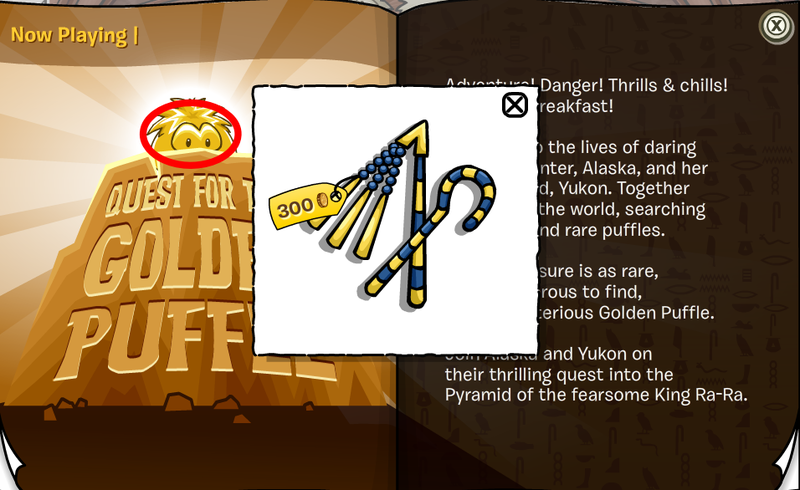 Quest for the Golden Puffle at the Stage! 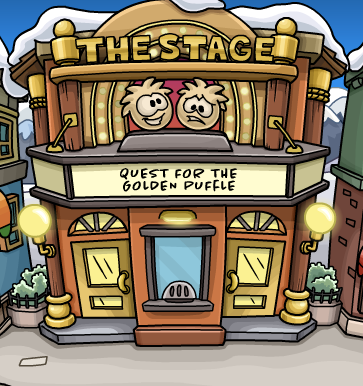 Club Penguin has returned "Quest for the Golden Puffle" to the Stage! Go to page 1 of the catalog. Click on the Golden Puffle. That's all the cheats in the catalog. Enjoy the play! 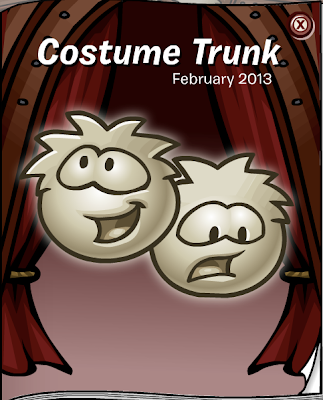 Are you glad this has returned to the Stage just in time for the Puffle Party? The comedy stage for Red Nose Day has arrived at the Coffee Shop! 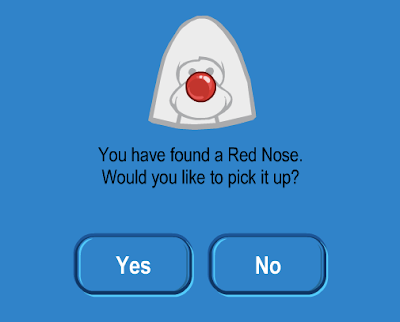 Everyone pick up your FREE Red Nose! Is any of you from the UK involved in Red Nose Day!? Club Penguin Times #384 is here! A puffle hotel coming! Whaaa? AWESOME! The Hollywood Party turned out great! I hope everyone enjoyed it! AA answers the much asked question about the red light at the beacon. If you don't know the story please go read! 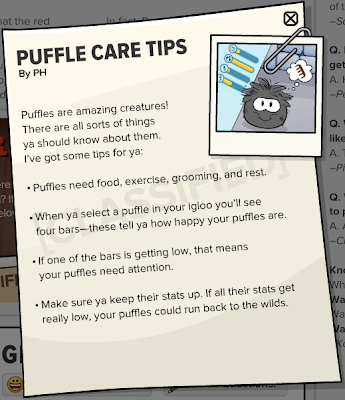 Lots of things about puffles this newspaper! 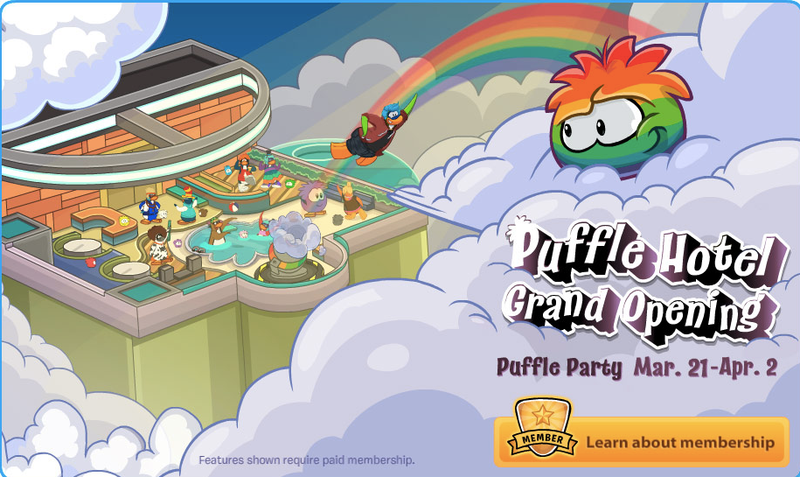 The puffle party is comin soon! TOP SECRET: Command Room Update! SHHHHHH! 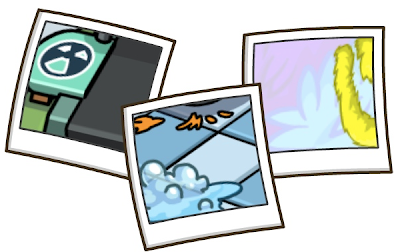 THIS MESSAGE IS CLASSIFIED FOR SECRET AGENTS ONLY! 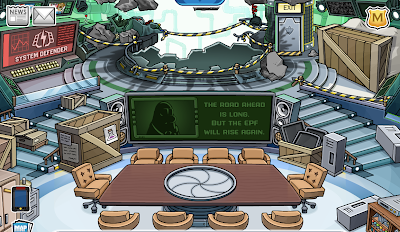 Starting this week, the EPF will be re-building. The team is working on a NEW MISSION for elite agents. 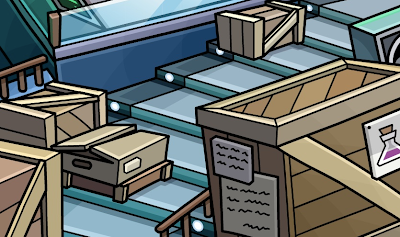 This is going to be a whole new phase for the Elite Penguin Force! 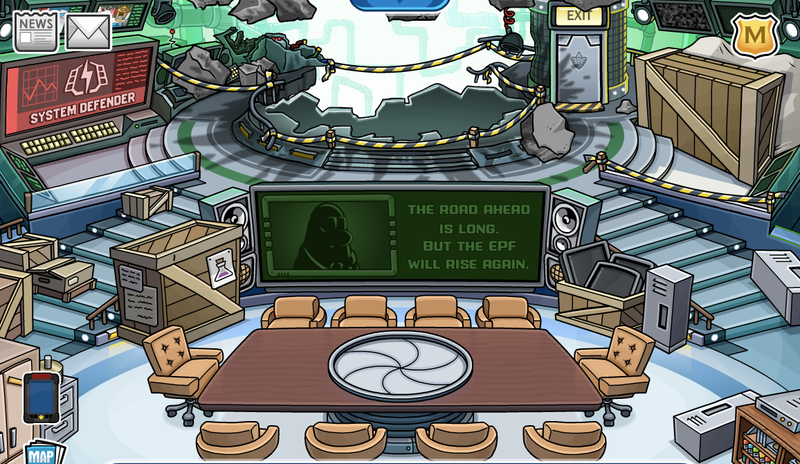 What do you think a new and improved EPF HQ will look like? And what do you think is in those boxes? Maybe like party confetti, brownies or dancing pumas. I don't know. That's just what I'm getting from those notes on the side of that box. Puffle Party (Gotta Have a Wingman) Music Video! Ok that song, whatever. But did you see that at the end!? 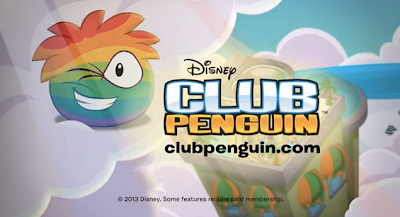 OMG a rainbow puffle!? This is crazy! I can't believe this is finally happening! What do you guys think!? Are we going to be able to get this puffle during the Puffle Party!? Help raise money for Red Nose Day in the UK! Hey guys! If you're in the UK and you like to help raise money for charity by making people laugh, man have I got somethin' for you! So again, if you’re in the UK, come on down to the Coffee Shop later this week to pick up your FREE red nose and start doing something funny for money! 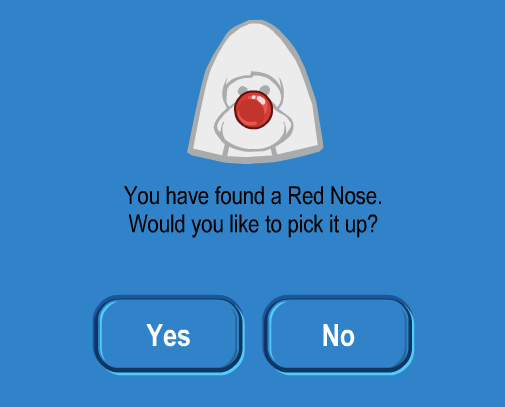 For every person that sends Club Penguin a screenshot, Disney will donate £1 to Comic Relief (up to £100,000)! 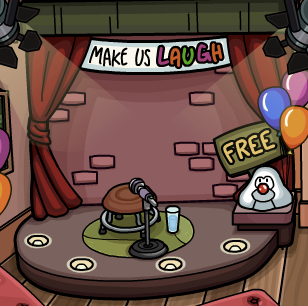 And if you're from the US and you have some funny joke that you think could be used, you can share those jokes in the comments box on the Cp Blog to help out your fellow UK buddies! Also, I wanna hear your guys' FUNNIEST jokes! So comment you best jokes and I'll be sure to read them all! Daffodaily5's Featured Fashions: February 25th! Here are this months Featured Fashions! Check 'em out! Here comes Purplep95211 who looks sooo lovely: The hair! The dress! The necklace! It’s just perfection. Thanks to 97percent for the nomination! 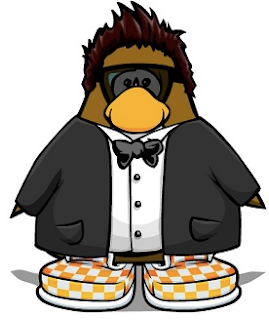 Check out the shades on The Waddle1, I mean, how super-uber epic does he look? 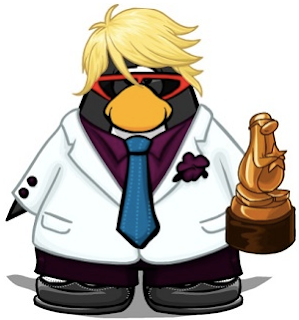 It’s a good job he nominated himself, as it looks as though he’s taking home the award for being Mr Cool tonight! Everyone make way for Lulu8213. 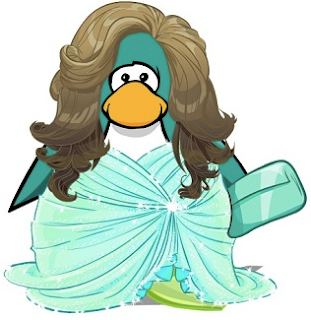 She’s looking fabulous in her sparkly dress and matching bag. They say big hair is sooo this season, so she is bang on trend! Now last, but by no means least, strutting down the red carpet in his ace orange check sneakers, we have the one and only Bedard10 closing the show in style. What a dude! Awesome! And remember, nominate you stylish buddies! Or yourself, like "Mr. Cool" did. Ha! Do you guys like the monthly Featured Fashions? Or are they getting kinda lame? 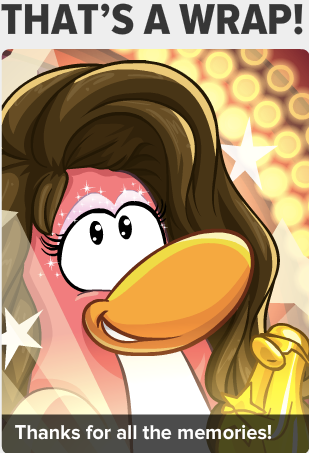 Club Penguin Hollywood Party: GOLD Awards! Club Penguin Hollywood Party: Silver Awards! Reviewed By You: CP Movie Stages! Club Penguin Pin Cheat - GOLDEN AWARD PIN! 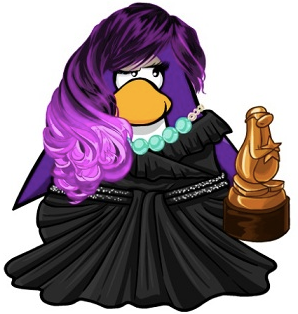 Club Penguin: Awards Ceremony Is Here! Hollywood Party Awards Ceremony Sneak Peek! Become A Super Star: February 17! Become A Super Star: February 16! Reviewed By You: Hollywood Party! 2013 Hollywood Party Is Here! Club Penguin Album Out NOW! Daffodaily5's Featured Fashions: February 11th! Club Penguin Prehistoric Party Reviewed By You! Club Penguin Pin Cheat - SHOOTING STAR PIN! 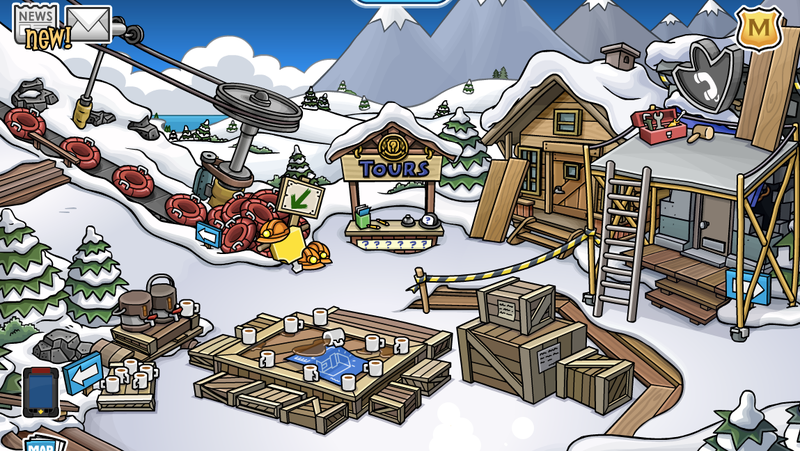 February 2013 Club Penguin Better Igloos Cheats!